PLAINSBORO, New Jersey (WABC) -- Police in New Jersey are searching for the driver of a semi-trailer that smashed into a woman's car Thursday morning and fled the scene. 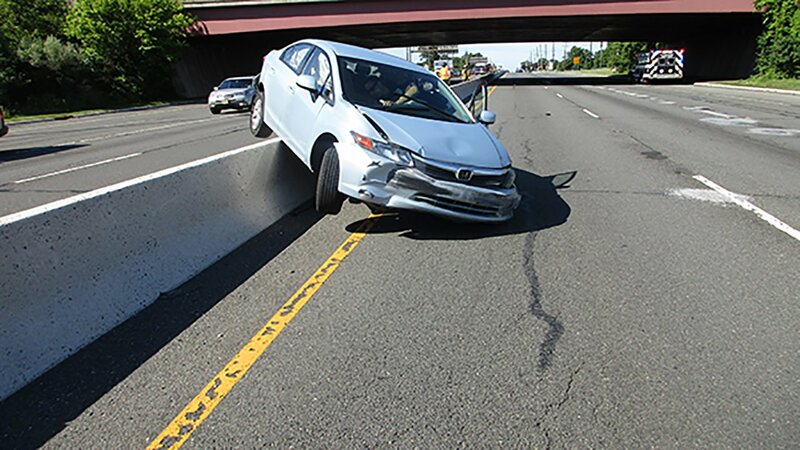 The accident happened at about 9 a.m. along Route 1 in Plainsboro, where police say a woman in her 30's was driving a Honda Civic that ended up on a concrete median after being struck. According to police, the white semi-trailer was traveling southbound on Route 1 near College Road when it hit the Honda Civic, which was in the center lane, from behind and pushed the car forward. The Honda drifted slightly left and was struck again, causing it to go up and onto the concrete median. The woman suffered minor injuries and was taken to Princeton Hospital. Investigators are also trying to determine whether it was a road rage incident, or whether the truck driver may have fallen asleep at the wheel. Police estimate it was a 40-ton semi-trailer that hit the vehicle.